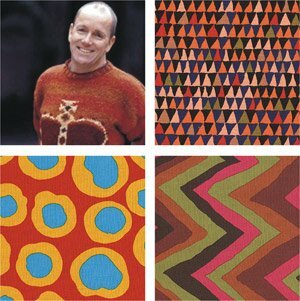 Brandon Mably, who for many years has been the manager of Kaffe Fassett's Studio, has produced a range of fabrics for Rowan. Raised in a small seaside town on the coast of South Wales, Brandon Mably has been interested in colour and design since he was young. According to author/ designer and Mably mentor Kaffe Fassett, Mably has "one of the sharpest eyes for style" that he has ever come across. With no formal education in design, Mably made a radical career change from cooking to knitting in the late 1980's after a chance meeting with the world-famous Fassett. From the moment he entered Fassett's studio, Mably realised the creative potential of knitwear designs and soon became Fassett's apprentice. For many years Mably organised the running of the Fassett studio, where Fassett trained him to knit, needlepoint, hook rag rugs, and grout mosaics. An inspiring teacher, Mably began travelling the world with Fassett doing workshops. Exotic locales such as Africa, Iceland, Guatemala, and India filled his designer's eye with inspiration and an explosion of colour and pattern. An avid and enthusiastic teacher, Mably has learned one thing over the years - that most people have buried in them a sense of colour and design. And it is helping his students discover that design sensibility that continues to inspire and motivate Mably's work. Brandon has his own website where you can see more of his work . 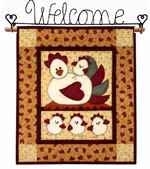 The Cotton Patch are very happy to announce our own-brand range of waddings. 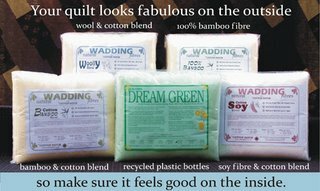 The four new waddings are made from wool, bamboo fibre or soy protein fibre blended with cotton to provide a more sustainable alternative to using 100% cotton wadding. All types are suitable for a wide variety of craft projects including quilts, wall hangings, doll making and other crafts that require a filler. Excellent for hand or machine quilting. I was expecting the bamboo wadding to be soft since I have a baby and his bamboo blankets are wonderfully soft. What I wasn't expecting was how good the soy blend felt, it really is wonderfully soft and smooth. As well as the new range we also have the Dream Green Waddings made from recycled bottles. The Cotton Patch has a large range of waddings and battings, which include silk, wool, polyester and cotton, from well known manufacters such as Hobbs, Warm and Naural and Quilters Dream in sizes from Crib to King.